Geographical location plays an essential role in the context of marketing the self storage business. The services are mostly location specific and so are the users of the services. Traditional marketing methodologies have given way to digital marketing - thanks to the internet - that has now become a game changer in the marketing universe; more so the local market. This has been coupled with the ever-growing use of handheld (mobile) devices and its preference over traditional desktop devices by users. Mobile devices are soon becoming our virtual assistants in the form of Siri, Google Assistant and Cortana. The user is now searching differently too. This is a deadly combination, and has led to a kind of user behaviour that has been termed by Google as micro moments. What are “near me” searches and micro moments? According to Google, micro moments are critical touch points within today’s consumer journey, and when added together, they ultimately determine how that journey ends. These fleeting moments give rise to very specific, intent-based searches by users - a.k.a near me searches. In the context of local market, these searches include the phrase “near me”, “nearby”, etc. These are called micro moments for a reason. The low lifespan of this moment makes it critical for the self storage business to be there in front of the user when they need you the most. Observations - Search terms containing the suffix ‘near me’ have gained popularity since 2013 and currently they are at maximum popularity. These type of searches are generally done from mobile devices and use voice search for most times. 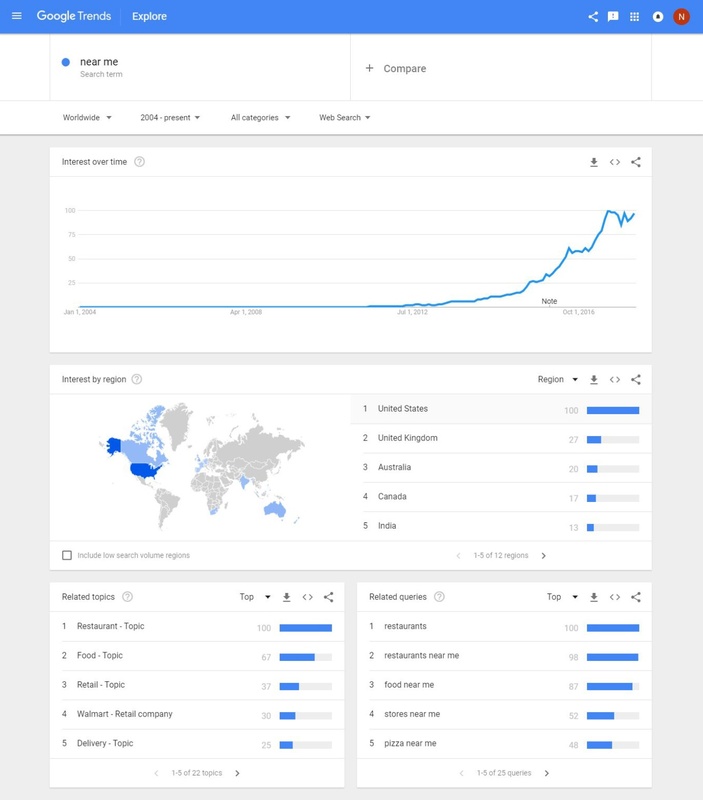 Although the USA is at the forefront of such searches, Australia is currently at position 3 and this definitely shows huge potential in the near future. 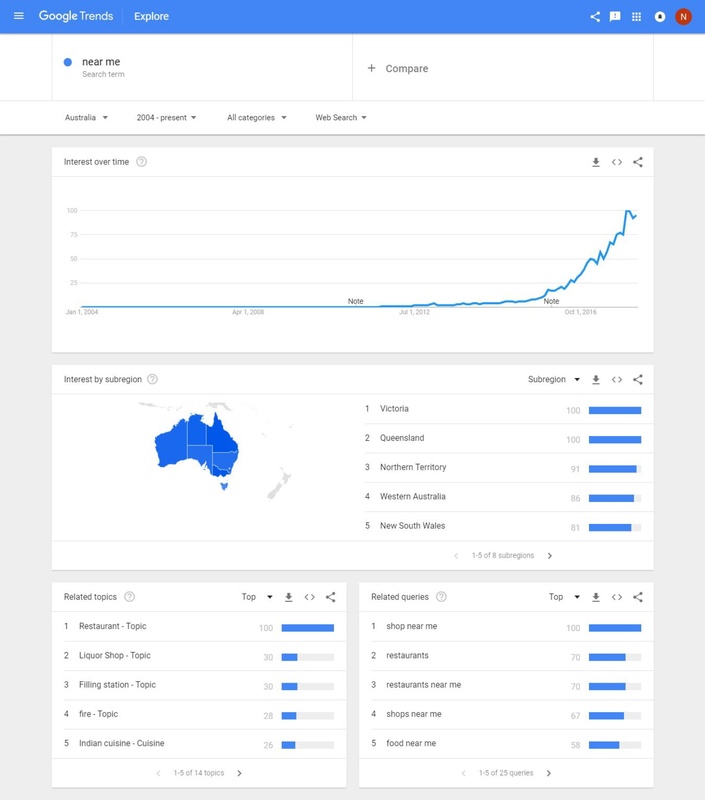 Observations - If we consider the searches containing the suffix ‘near me’ in Australia, they have also gained popularity since 2013 and shows that they follow the global trend data. The users in the states of QLD & VIC are the ones using this term the most and “shop near me” is the most popular search term in Australia. Observations - The search term ‘self storage near me’ is currently at maximum popularity as the trend shows and will continue to keep trending in the near future. The term has gained immense popularity in the last 2 years and hence it is the right time to capitalize on this growing trend. The growing popularity of these “near me” searches needs to be tied in with your online marketing strategy to leverage the ever-increasing need for such information. What makes it even more important is the fact that the current digital real estate in Australia is yet to be saturated, and before it does (like it has for other markets), you should take advantage of the demand and optimise your website as well as digital marketing campaign to align with this need. Make sure that your website is mobile friendly (check your website mobile friendliness here). This means the website should be rendering properly across all devices, especially the handheld ones. This also means that the website should load fast on mobile devices as well (check your website mobile page load score here). Make sure your website scores high in both mobile responsiveness as well as page load speed on mobile devices. Your website should list your correct business name, address(es) and phone number(s) whenever it is mentioned. Consistency in map plays a major role in boosting your presence in front of the users. Similarly, any inconsistency leads to lost opportunity in terms of getting new business. This is not limited to the website alone. Any profile / listing of yourself storage business on third party websites which includes your name, address phone number needs to be consistent with the correct NAP. When it comes to listing local businesses, especially in micro moments searches like near me and nearby, Google has always been seen to provide preference to its own local listings over the business websites themselves. 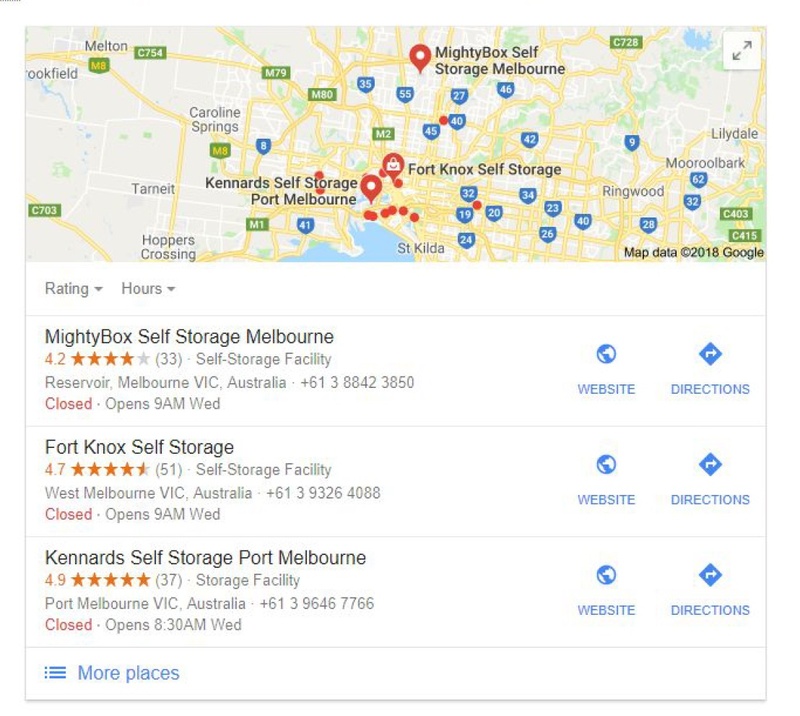 Whenever a user searches for a local query like self storage for rent near me, Google shows a list of its own local business listings around the location of the user as the first set of search results in organic search. This increases the chances of local businesses to get a higher click through rate then the actual websites that are listed below them. It is therefore important for you to make sure that you claim your own Google local business listing and if you already have one, you optimise it for the near me searches. This includes adding all the required as well as recommended information in the Google local listings along with photographs of the facilities that are available at the location. It takes anywhere between 1 to 8 weeks to get your business verified by Google when you are claiming your Google local business listing. This also includes encouraging your existing clients to add user reviews which play a critical role in the buyers decision making. To make sure that the information that you show to the user once they have landed on your website is relevant to them and to their search, it is recommended to have dedicated web pages for each of the locations that you serve in. This helps the user connect with you immediately and get exactly what they are looking for. According to research, adding the exact phrase “near me” relevantly in the content has shown to improve the overall performance of digital marketing campaign in terms of higher reach, click through as well as new business acquisition. Consider optimising the website content for near me, nearby as well as near [location]. This is one of the most underused but effective tricks to improving your local presence on search engines. Schema tags are snippets of codes that, when added to your website, specify the type of information enclosed within them to search engines like Google. For example, you can define schema tags for your locations by adding specific tags for business name, address, area code, phone number, etc. wherever mentioned on the website. You can also add schema tags for user reviews like ratings/stars, etc. Defining the schema helps Google understand what each type of information is and then showcase the information directly in Google's search results in the form of rich snippets that show up in Google knowledge graph. That way the user can see all the information like the location, the phone number, the user ratings, etc without even having to click and enter the website. This decreases the length of the purchase cycle and increases the chances of conversion. Make sure you have defined local schema tags for all business addresses and locations specified on the website as well as user review schemas for any user reviews on the website. It's not enough to fix your website and your local listings alone, unexpected outrank your competitors for the near me searches. You also need to build a Portfolio of relevant and quality backlinks and citations to your website, especially the location specific landing pages, from various relevant and authority third party sources. This signals Google that not just you but others I also talking about you and linking back to you or citing you. This helps Google correlate all this information and attribute the necessary value to your website in terms of relevance to the near me such a specific to your locations. Make sure that when you are acquiring this backlinks and citations, the links or citation text is geographic anchor text (e.g. Jet Ski storage units in Sydney). This further strengthens the value of the backlink or the citation adding to the overall performance of the digital marketing campaign. Some of the tips mentioned above are easy to execute and will take very little of your time and effort. Others are comparatively technical in nature and will require help from experts. In both the cases, it would seem like valuable investment of time and efforts when compared with the ROI in terms of business reach, footfalls, and the potential to get new customers for your self storage business.